Has a trifold design with convenient velcro closures for efficient storage and portability. Space-efficient storage for light and compact transportation without the need for heavy or bulky cases. The Phot-R filter pouch is designed to hold and protect 6 square or round filters up to 86mm wide and 100mm tall. This makes it perfect for Cokin A and P Series filters. 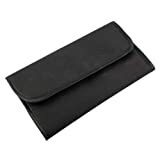 The pouch includes clear inner lining for quick and easy access, and trifold design with convenient velcro closures for efficient storage and portability. Phot-R products come with 1 year limited Phot-R warranty. This entry was posted in Discount Photography and tagged Carry, Case, Filter, Filters, lens, PhotR, Pocket, Pouch, wallet by Ball Photo. Bookmark the permalink.